International art biennales have become a fixture in the calendars of art connoisseurs and the general public alike, drawing visitors from all over the world with works by art celebrities such as Ai Weiwei, Maurizio Cattelan and Marina Ambramovic, in one place. For example, the six-month-long Venice Biennale last year attracted almost 650,000 visitors. It was a 23 per cent increase from its previous edition in 2015 and more than half of the visitors were international. Last year was billed as a blockbuster year for art lovers because of the number of important art fairs taking place - there was the Venice Biennale, arguably the most important contemporary art festival in the world; contemporary art exhibition documenta, which takes place every five years in Kassel, Germany; Skulptur Projekte Munster with its specially commissioned art in the city of Munster, Germany, once every 10 years; and the Yokohama Triennale, a contemporary art exhibition which takes place every three years in the Japanese port city. This year is no less stellar, with at least 25 major art biennales scheduled to happen, some brand new and others celebrating major anniversaries. The Sunday Times picks the biennales worth travelling for this year. Australia's pre-eminent showcase for home-grown and international contemporary art, the Biennale of Sydney is in its 21st edition this year. It is recognised worldwide for its experimental and provocative commissions and this time, 70 artists from 35 countries will be presenting their work. Close to 60 per cent of it is new. The works will be spread across seven venues in Sydney under the eye of artistic director, Ms Mami Kataoka. An art curator and writer, she has been chief curator of the Mori Art Museum in Tokyo since 2003. The theme for this year's Biennale is Superposition: Equilibrium & Engagement, and many of the artworks will examine issues of migration through the artists' own journeys and events around the world. Ms Kataoka will lead the Biennale's keynote conversation with celebrated Chinese artist Ai Weiwei on March 15, in conjunction with the Sydney premiere of his Oscar-shortlisted documentary about the refugee crisis, Human Flow (2017). Three of the artist's works will be on display during the Biennale, including Law Of The Journey, 2017, a 60m inflatable boat made of the same material as the dinghies carrying refugees from Turkey to Greece, filled with more than 250 figures, which will inhabit one of the industrial buildings on Cockatoo Island. Other venues include the Art Gallery of NSW, Artspace, Carriageworks, Museum of Contemporary Art Australia, 4A Centre for Contemporary Asian Art and Sydney Opera House. At Artspace in Woolloomooloo, distinguished Flemish painter Michael Borremans will exhibit a selection of video works, paintings and drawings, and Vietnamese artist Tiffany Chung will present artworks depicting the patterns of diaspora, such as an embroidered textile map. A series of large-scale immersive installations will also be on display at former rail-yard Carriageworks, including a psychedelic five-channel video work by British-based duo Semiconductor. Of this year's selection, Ms Kataoka says: "The history of the people of Sydney collectively reflects the history of the world in the 20th century, in particular the movements and migration of people and cultures away from conflict. My hope is that the artworks in this Biennale will serve as a catalyst for thought for all of us." 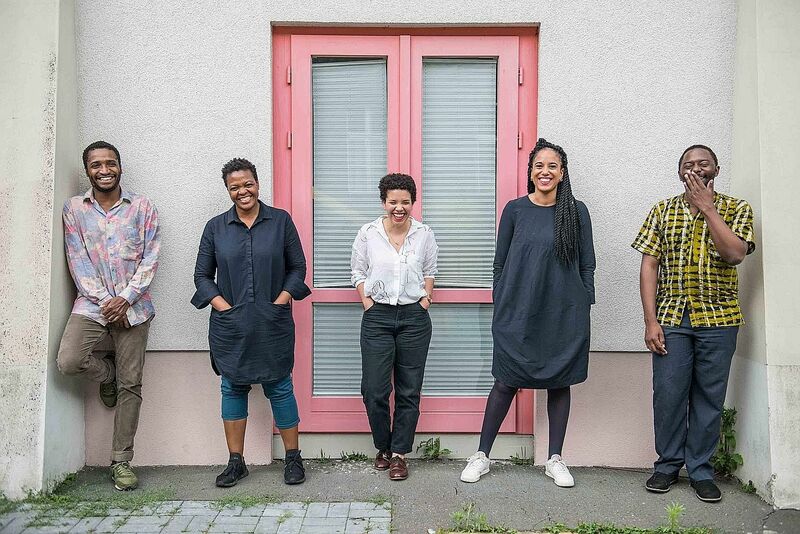 The curatorial team of the 10th Berlin Biennale for Contemporary Art (from far left) Thiago de Paula Souza, Gabi Ngcobo, Nomaduma Rosa Masilela, Yvette Mutumba and Moses Serubiri. When: June 9 to Sept 9 With a key location in one of Europe's cultural capitals, the Berlin Biennale for Contemporary Art has established itself as an art lab of sorts, providing space for artists to experiment and examine the latest issues and trends. It has also been a platform to champion emerging artists since its inaugural exhibition in 1998. This year, for its 10th edition, South African artist, educator and curator Gabi Ngcobo has put together a diverse team of curators - Mr Moses Serubiri from Uganda; Ms Nomaduma Rosa Masilela from New York; Mr Thiago de Paula Souza from Sao Paulo; and Ms Yvette Mutumba of Berlin. With the help of graphic designer Maziyar Pahlevan from Iran, they are exploring the anxieties and conflict created in Berlin, Germany and the world by what they describe as a "collective psychosis", in which society and governing structures ignore or misunderstand the complex subjective nature of the world and the people in it. This year's theme, We Don't Need Another Hero, a direct reference to the 1985 song by Tina Turner, is their answer. Through artwork and conversations with artists and contributors beyond the art world, the curators investigate the links between knowledge and power and suggest that rather than waiting for a saviour, self-belief and self-preservation are the indispensable strategies for creating change. Visitors will be asked to challenge their preconceived notions of structure throughout the Biennale's three-month-long public programme, which will use artwork and performances to encourage visitors to rethink their points of view and accepted social and political structures and to consider new ones. When: July 14 to Oct 28 The premier biennial of contemporary art in Britain, the Liverpool Biennial, celebrates its 10th edition this year. This year's theme is Beautiful World, Where Are You?, inviting artists and visitors to reflect on a world in the midst of social, political and economic unrest. It is curated by Ms Kitty Scott, head curator of modern and contemporary art at the Art Gallery of Ontario, and Ms Sally Tallant, director of the Liverpool Biennial. The show's exhibitions will take place in public spaces and leading art venues around the city, including Open Eye Gallery, National Museums Liverpool, the Liverpool Playhouse, Victoria Gallery & Museum (University of Liverpool) and the Tate Liverpool museum of contemporary art. Many pieces have been specially commissioned for Liverpool, including Everybody Razzle Dazzle, 2015, by one of the major figures of British pop art, Sir Peter Blake. He has covered the city's iconic Mersey Ferry Snowdrop with a colourful pattern, transforming the vessel into a moving artwork as it plies the river. The Biennial and Liverpool Mayor Joe Anderson also commissioned Korean artist Koo Jeong A to design Britain's first glow-in-the-dark skatepark. Other works on display include Carapace, 2009, by Canadian artist Brian Jungen, who transforms everyday commercial objects into colossal whimsical sculptures. In Carapace, 2009, he turns garbage bins into a giant turtle shell. Bord de Mer, 2009, a video installation which transports viewers to the seaside, by award-winning French film-maker, visual artist and pioneer of French New Wave cinema Agnes Varda, is another festival highlight. The experimental work of Korean artist Suki Seokyeong Kang is also on show. Her piece, Jeong ¼, 2011-2015, mixes media, including painting, installation and video, to convey the various conditions that individuals face in society. Founded by Italian-Brazilian industrialist Ciccillo Matarazzo in 1951, Bienal de Sao Paulo is the second-oldest biennale in the world after the one in Venice, and is the biggest biennale in the Americas. Long respected as a platform for Brazilian, Latin American and international contemporary art, the Bienal has been instrumental in bringing Brazilian art to the world stage. This year, things are being done a little differently. Rather than dictate the exhibition's art selection, the Bienal Foundation, which runs the event, announced that its 33rd edition would hand the reins over to the artists themselves. Seven artists from different backgrounds, generations and media were invited to compose a group show in which their work will be presented with the work of their peers. The result will be seven independently curated exhibitions under the Bienal's theme, Affective Affinities, highlighting the artists' process and their influences. This year's artists include Alejandro Cesarco, a Uruguayan artist who lives and works in New York, whose work focuses on literature, translation and image; Spaniard Antonio Ballester Moreno, whose exhibition will touch on the history of abstraction and its relationship with nature, pedagogy and spirituality; Swedish artist Mamma Andersson, who will examine figuration (representation of bodies and the world) in the painting tradition, from popular art to contemporary art; and Wura-Natasha Ogunji, an American artist of Nigerian descent, who will assemble a group of artists whose work focuses on identity and the African diaspora. In this way, each artist's work will be viewed in context and in parallel with the works which inspired, informed or complement his own. According to the foundation and the edition's head curator Gabriel Perez-Barreiro, the Bienal wants to show "the artistic and cultural links and affinities and the multiple influences that are intrinsic to the artistic process". All of the Bienal's exhibitions are free to the public. One of Asia's most influential biennales and China's predominant showcase of contemporary art, the Shanghai Biennale will return for its 12th edition this year. Steering the exhibition is an internationally renowned art curator, critic and historian, Mr Cuauhtemoc Medina. Though this year's theme and selection of artists have not yet been announced, Mr Medina believes the Shanghai Biennale is in a unique position to tackle important artistic and historical questions of the modern era, given the cultural and economic significance that China and Asia have in global issues today. "I hope that I will be able to produce, in collaboration with colleagues from China and around the world, an exhibition that will enhance the importance of a growing cultural production that infuses subjective complexity into the complex texture of our times," says Mr Medina, who is from Mexico. The Biennale will take place at the Power Station Of Art, the renovated former Nanshi Power Plant on the banks of the Huangpu River. The 42,000 sq m space is home to China's first state-run contemporary art museum and offers 15,000 sq m of exhibition space, including a 165m-tall chimney, a fixture of the city's iconic skyline. Ms Shelley McNamara (right) and Ms Yvonne Farrell are curating the 16th Venice Architecture Biennale. The sister festival of the famed Venice Biennale for contemporary art, the Architecture Biennale is one of the biggest architecture exhibitions in the world. Architects and designers gather from all over the world to present their latest projects and learn about the newest architectural breakthroughs. This will be the first Bangkok Art Biennale, a contemporary art exhibition of work from around Asia, Europe and the Pacific. Engaging with the city's rich cultural heritage and diversity in venues including historic temples and modern galleries, exhibited artists will include the likes of famed Yugoslavia-born performance artist Marina Abramovic. The Biennale of Contemporary African Art, Dak'Art in Dakar, Senegal, has been the leading exhibition of contemporary African art for well over a decade. This year's theme is "The Red Hour", and will include the work of more than 70 artists from around Africa and the African diaspora. The work of about 200 more artists will also be displayed at fringe events throughout the city.